Our Nitrile gloves are manufactured using synthetic latex, contain no latex proteins, and are more puncture resistant than natural rubber. 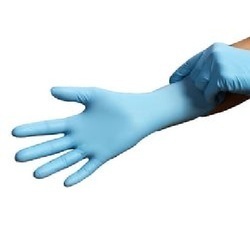 Nitrile is quickly becoming the material of choice for single-use gloves. Backing upon our skillful and energetic workforce, we are immersed in presenting a qualitative gamut of Examination Glove. These products are developed using the high-grade raw material which is been obtained from certified vendors of the market. In addition to this, our complete range of products we offer is used at various places. Purple Nitrile Long Cuff Gloves 18"